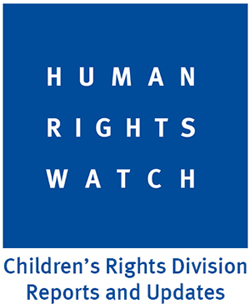 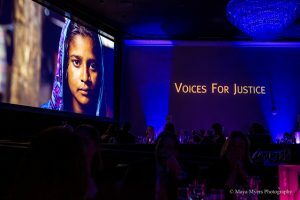 VOLUNTEERS NEEDED: HRW LA Summit June 2-5! 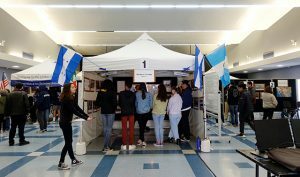 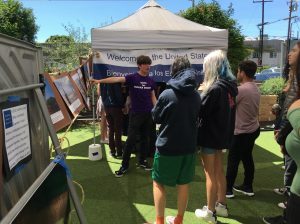 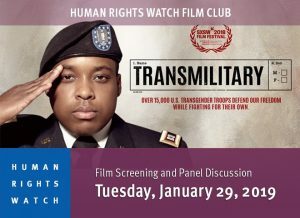 March 1, 2019: Palisades Charter HS’s Human Rights Watch Student Task Force presented their special exhibit, “Human Rights on the Southern Border,” on Friday, March 1 in their school auditorium. 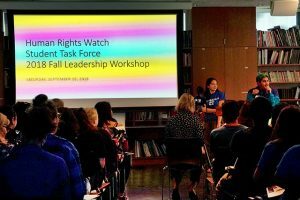 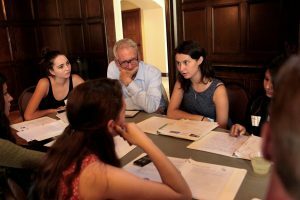 January 31, 2019: As headlines about immigration dominate the news, 60 Student Task Force leaders, teacher advisers and supporters gathered for the 2019 Winter Leadership Workshop to launch Human Rights on the Southern Border campaign. 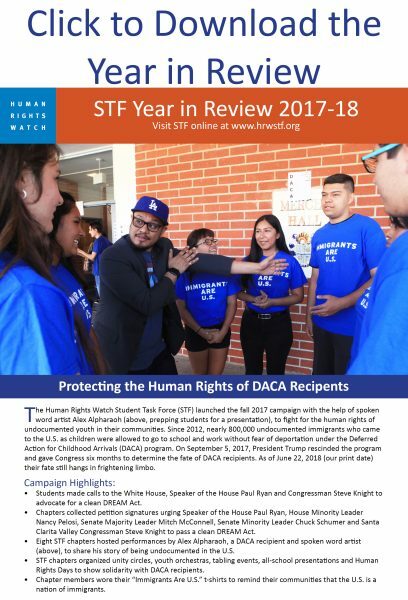 Please join us for the STF Winter Leadership Workshop (click to officially RSVP) to learn about our new spring advocacy campaign! 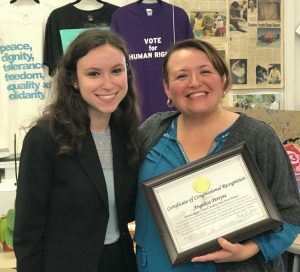 November 28, 2018: Palisades Charter HS STF surprised STF Teacher Advisor Angelica Pereyra with a Certificate of Congressional Recognition presented by Aurelia Friedman, a representative of Congressman Ted Lieu. 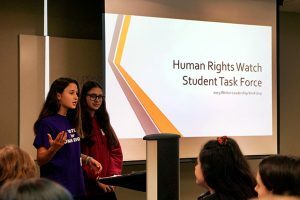 At their regular Wednesday meeting, students had also prepared an accordion business card version of the Universal Declaration of Human Rights (UDHR) to give everyone in attendance, plus, STF’s traditional blue icing cupcakes with a toothpick flag waving an article of the UDHR. 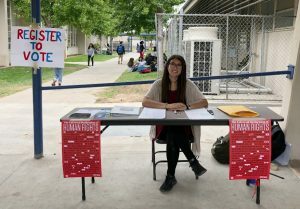 Students gave a short presentation about the significance of the UDHR and thanked Ms. Pereyra for inspiring STF members for nearly 20 years. 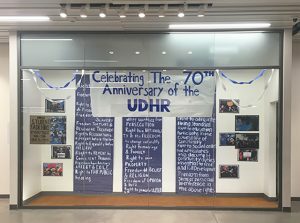 Photos of the event will circulate on social media on December 10, the official 70th anniversary of the UDHR. 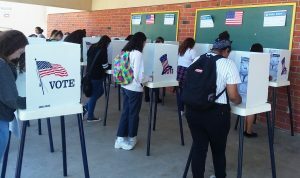 According to US News, “young adults motivated by social issues and dissatisfied with the Trump administration turned out in record numbers to vote in the 2018 midterms and backed Democratic candidates by historic margins, initial analysis shows. 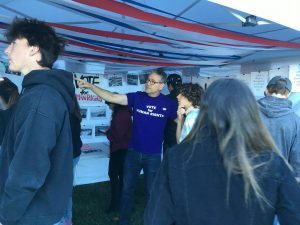 This fall, HRW Student Task Force members got more than 1,200 people registered and preregistered to vote, educated their campus communities and got out the vote leading up to the November 6 midterm elections. 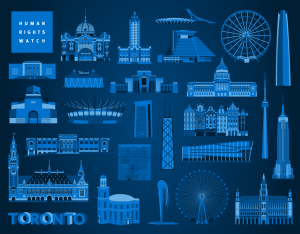 Congratulations on so many successful events! 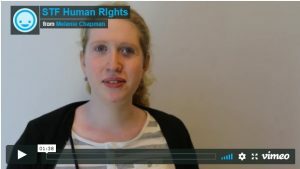 Celebrating 70 Years of the UDHR! 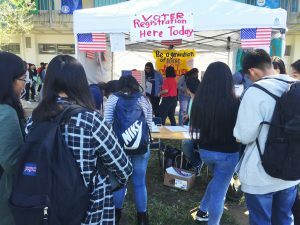 September 25, 2018: STFers at Archer School for Girls, Crossroads School, Culver City HS and Sierra Canyon School participated in National Voter Registration Day preregistering and registering students and faculty to vote in the November 6, 2018 midterm elections. 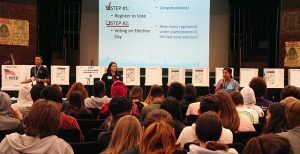 STF chapters got more than 150 people registered to vote throughout the day!